The team produced a 3D model of the highway construction and an archaeological site with a 24 hour turn-around time. In the nearly 20 years since the Balkan conflicts, the women of the Krusha e Madhe village in Kosovo have been trying to rebuild their community and lives. But they lack access to land rights systems, a challenge for almost 70% of the world’s population, especially women. The World Bank is implementing a US$ 12 million Real Estate and Cadastre Project to assist the government in producing a national cadastre system and geospatial data infrastructure. This is where Unmanned Aerial Vehicles (UAVs), or drones, have come to the rescue. The World Bank’s Innovation Labs in the Leadership, Learning, and Innovation vice presidency owns a “Sensefly eBee fixed-wing UAV” to pilot its usage in World Bank projects. UAVs are rapidly becoming an effective tool for mapping in many diverse scenarios. In 1999, the men and boys of the Krusha e Madhe village in Kosovo were killed in the Balkan conflicts. In the almost 20 years since that time, the women of Krusha have been rebuilding their community and lives with the support of international donors. Like many small business owners around the world, the women have organized cooperatives and sell their products throughout the region. However, they face one major issue: most of them do not have formal registration to their land or homes which prevents them from using their land as an effective economic asset. Lack of access to land rights systems is currently a challenge for almost 70% of the world’s population, especially women. “I have tried so many times to get credit and they’ve rejected me because I didn’t have the property documents to put down as a guarantee,” said Fahrije Hoti, the Director of the “Krusha” Cooperative. The time, cost and complexity of conventional land surveying and registration (also known as cadastral mapping and registration) is an obstacle for these women. It often takes years and is too expensive to complete, leaving these women with no information or legal protection of their rights. The World Bank is implementing a $12 million Real Estate and Cadastre Project to assist the government in producing a national cadastre system and geospatial data infrastructure. The team has begun to use new technology and methods to improve the effectiveness of the project. Unmanned Aerial Vehicles (UAVs), more commonly known as drones, have come to the rescue. These commercial drones are small and feather-light. They offer a turnaround mapping service from planning to product in a matter of days or weeks rather than months or a year and at a fraction of the cost of conventional aerial surveying using manned aircraft. The World Bank’s Innovation Labs in the Leadership, Learning, and Innovation vice presidency owns a “Sensefly eBee fixed-wing UAV” to pilot its usage in World Bank projects. Kathrine Kelm, senior land administration specialist from the World Bank Group’s Global Land and Geospatial unit had been working on land management in Kosovo and was looking for a way to make her work there more effective. Her team had already piloted the use of drones for cadastral mapping in Albania in 2014, but were looking to scale up the work to operational value. Along with Dr. Bruno Sanchez Andrade Nuno, data scientist with Innovation Labs, and an international team of expert consultants, the team strategized together to improve the identification of land plots using drones. Kelm and Sanchez travelled to Kosovo in December to complete a one week cadastral mapping activity. They worked closely with the National Mapping Authority and completed 25 flights. After 3 days of training the team operates the UAV as a mobile mapping unit capable of producing accurate maps with local communities. The drone flies at around 100 meters above the ground, and always within contact and remote control. The resulting product has a high resolution of around three centimetres per pixel. The team was able to process the images locally with the help of the National Mapping Authority and flight approvals were obtained from the Civilian Aviation Authority and KFOR/NATO. In the past two decades many cities in Kosovo have also experienced rapid, unplanned urban expansion resulting in informal settlements, illegal constructions and chaotic development. The government of Kosovo has recently introduced a program for land owners to legalize their property rights and municipalities are working to integrate the new developments and provide services to citizens. “UAV technology offers a new tool to produce accurate, cost effective and up to date maps and 3D models of cities for the benefit of citizens, local government, utility companies, businesses and others,” said Sanchez. Even though the team’s initial work was focused on integrating UAVs into the cadastral mapping process, they received a spontaneous request for assistance by the highway authorities. A municipal representative informed them that a road crew had recently found an archaeological site near a highway under construction. 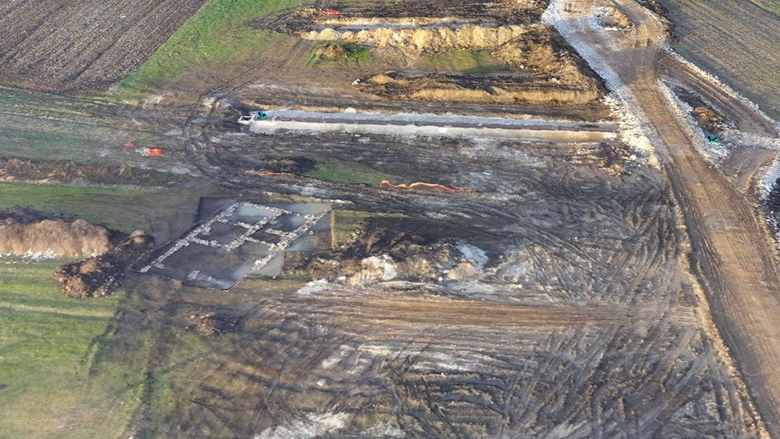 The currently available aerial imagery provided no evidence of the site. The team quickly mobilized the drone to produce a high resolution 3D map of the area in less than 24 hours. This provides fresh and accurate information for rerouting the road, additional land acquisition needs, cultural heritage preservation and other important decision making. UAVs are rapidly becoming an effective tool for mapping in many diverse scenarios and the work in Kosovo demonstrates only a few examples of their potential. The World Bank team includes Kathrine Kelm, Dr. Bruno Sanchez-Andrade Nuno, Eric Sundheim, geodetic surveyor from Geomatikk Norway; Ana Jesenicnik cadastral engineer from Sensefly Switzerland; and Qazim Sinani and Korab Ahmetaj, cadastral surveyors from the Kosovo Mapping Authority.